The information on this page was sent to my courtesy of Eleanora Golobic, Archives, AFS Intercultural Programs, she would be happy to answere any questions. With the American Field Service in Italy, Oct. 11 (AP) (Delayed)---A volunteer ambulance driver of the American Field Service, George Holton of Bethlehem, Pa., one of the first Americans to enter the Italian Adriatic coastal city of Termoli, when British commandos stormed it six days ago, has been commended by the Assistant Director of Medical Services of a British division for his work under fire and for going through German lines at the outskirts of Termoli to pick up wounded. Lt. Francis J. Murray, platoon leader from Detroit, Mich., says Holton, one of his NCO's, was one of twelve AFS ambulance drivers who were the first Americans to enter this Jerry Stronghold, and then worked for 48 hours to evacuate wounded trough seesaw fighting for the town. During the first night after their arrival, they carried approximately 300 patients in their four-place ambulances, making trip after trip from the Advanced Dressing Station (ADS) in Termoli to a Medical Dressing Station (MDS) thirty-five miles away. Murray says the AFSers, some of whom never had heard gun fire before-- the others had served with the British Eight in North Africa-- could not have worked under worse conditions; long, long hours, muddy and often impassable roads, at night and without lights, not to mention enemy and cross-fire most of the way. The AFS ambulances were called-- after they had just moved up from tier own landing in southern Italy-- when British ambulances couldn't negotiate the seven muddy diversions that had to be made when Jerry blew up bridges and the road leading into Termoli. Holton had almost completed the 35-mile run from the MDS to the Termoli ADS when two burning British lorries became another obstacle. He began to pick up casualties there, leading them into his ambulance and the ambulances of Volunteers Walter Doyle, of Springfield, Mass..
Then, says Murray, quoting the British Assistant Director of Medical Services, Holton went through the German lines to pick up more British wounded. While gone on this job, which was beyond his duty, Holton's own ambulance was hit by enemy fire, one bullet going through the radiator and the driver's seat. Then the AFS driver went to work changing a punctured tire, but the action got too hot, so Holton transferred his wounded to Trainor's ambulance again and sent him off. After that, Holton put another wounded Tommy and himself in the back of a passing lorry and went to the ADS in Termoli. Lt. Murray adds that another of his NCO's, Howard Terrell, of New York City, was on duty at the ADS from his arrival through the German counter-attacks and until the British were undisputedly in possession. Once, when it looked as if the Jerries might retake Termoli, he was ordered back; but he stuck around. AFS platoon sargeant Richard Dickson, Bayside, L.I., also was much in the show, riding a motorcycle along the evacuation route to direct and assist the ambulances. At one particular point where the ambulances had tough going through the enemy fire--a pontoon bridge thrown up by the Royal Engineers--Dickson used to dive down alongside his motorbike when the going got heavy and wait there until it subsided. But once he dived ahead of his bike and kept going-- for no particular reason. A few seconds later a German shell landed near his bike and covered it with mud. The British salvaged it later, repaired a blown tire and bent wheel and were going to use it themselves when Dickson reclaimed it. The approaches to the pontoon bridge were under cover, but the Jerries had the bridge sighted from a nearby hill. Other vehicles making that run were knocked off too regularly by Jerry, but the ambulances got through. Lt. Murray himself had at least three narrow escapes, counting the sniper's bullets directed his way. He had come into Termoli the morning of the 8th, when the action was still going on in a slackened way. He says he left the schoolhouse serving as the ADS for a walk, turned down some sniper. So he got off the truck and around the corner in a hurry, with a couple more bullets chasing him. Murray calls the sniper "a damn' poor shot". Then he went to the "hospital" and found Terrell and Frank Marler of Caldwell, Idaho, taking a spring from Holton's immobile ambulance to use on Terrell's. And they, says Murray, were working away with little or no thought of sniper's bullets whizzing around. The officer implies they felt pretty safe, because most of the bullets were spent. The ADS told Murray that if the AFS hadn't been at Termoli, he "just wouldn't have known what to have done." The British medical officer further boosted the AFS with the statement that he did not want ever to hear that American ambulance drivers weren't needed in this war. In addition to Holton, Doyle, Terrell, Marler, and Dickson, the other AFS drivers to be the first Americans in Termoli were John Harkness, Milton, Mass. ; Mason Smith of Bronxville , N.Y.; Perry Culley, Washington, D.C.; Larry Bigelow of St. Paul, Minn.; Larry Toms, Carpinteria, Calif.; and William Rich of Staten Island, N.Y., another NCO. They had ten ambulances among them. Six more drivers and four ambulances arrived with Lt. Murray on the Eighth. The new drivers, who also got in for some sniping and other fighting, were William Cates, Memphis, Tenn.; William Lord of Seattle, Wash.: William Fogg, Cleveland, Ohio; James Gerhardt of Bethlehem, Pa.; and Louis Allen, Winchester, Virg. There were also two British cooks and one British water truck driver for the unit. The cooks soon set up a mess hall for the drivers in a Termoli restaurant. Murray says the new arrivals had a pretty warm session of shelling from the time they entered, about 8 a.m., until midnight, when they had cleared the ADS or its patients. The AFS officer adds that the action was particularly heavy because the British had to repair the roads before reinforcements could arrive. It was during those hours that the ambulance drivers of the AFS got their European baptism of fire and not incidentally garnered more laurels. An acting sergeant of another platoon, Charles E. Perkins of Christianburg, Va., who came into Termoli on the morning of the 9th with AFS messages, says all the infantry there joined in praise of the volunteers, many of them in or just out of college when they joined the Field Service. Perkins also says the infantry colonel added his work to the list of laurels for efficiency and willingness, plus an order to his men to bring in all the AFSers they could pick up for a Termoli victory party to by given the night after Jerry had moved out. Perkins, a 25-year-old graduate of Virginia Polytechnic Institute and a livestock farmer at Christiansburg, is back in familiar country, but for a different purpose now. From last January 1 until June 1 he was a prisoner of war in Italian camps after being captured while driving an AFS ambulance in North Africa. Then the Field Service also carried hundreds of wounded back down the recovery road. Perkins and Smith has set themselves up in the deluxe apartment of the Fascist leader of Termoli, who had fled, but Perkins had to leave for the AFS base workshop when he broke his wooded leg. There he hopes to have a complete good one made from the two he has broken already. Perkins also says that when the first AFS ambulance driver (un-named) arrived at the Termoli school used as the ADS, he undramatically asked, "Have you got any work for me?" He was told there was plenty, and asked how many he could carry. He replied, "All you can give me, and I can get nine more ambulance." H had not been none long on the way back to the MDS with his patients, when two more of the AFS men drove up, and shortly after that, the other seven ambulances also were making the 35-mile salvation run. D. Platoon, 567 AFS A.C.C., report of activities from October 1st 1943 to April 1st, 1944. D. Platoon, under Lt. F. G. Murray, was the first complete platoon of thirty ambulances of the AFS to land in Italy. Immediately the cars were sent North to Foggia where fifteen of the cars were sent with the 1st Canadian Division, five were held in reserve, and the remaining ten joined the 217 Field Ambulance then entering Termoli with the 78th Division. Since that day there have never been more than five cars not on duty, and frequently there was o reserve at all. During the six months beginning October 1st the cars travelled 163,671 miles carrying a total of 11,073 patients, one ambulance driven by Vol. L. Toms, possibly broke all records by carrying 269 A.D.S. to M.D.S. patients in one month. The story , apart from the first two weeks after landing, is not as dramatic as the statistics might indicate; the work has generally been a matter of steady plodding along over fairly lengthy evacuations. Early on the morning of October 3rd Termoli had been occupied by an amphibious landing, but the battle had not yet developed to the violent degree of the following days. Four of the cars under Sgt. Dickson, arrived on the evening of the 3rd and were told that there would by no evacuations until six o'clock the following morning. At dawn five M.E. 's bombed the docks and straffed along the roads, beginning a period both of intense warfare which was to last two days and of work for the medical and A.F.S. personnel which was to last still longer. Two cars started out at six-thirty to make a twenty-eight mile run back; there were at least twelve diversions along their route made dangerous by heavy rainfall. The British Austins of the Field Ambulance were unable to go through, so the whole work fell to the Dodges which have four-wheel drive. By nine o'clock the M.D.S. and A.D.S. were cleared of patients, but the school-house adjoining was becoming jammed with casualties caused by concentrated shelling centering around the square where the medical units were situated; the shelling had started at eight o'clock and continued until noon. All the cars had gone out, and while they were gone the Germans occupied the station on the South side of Termoli. The ambulances began returning shortly before noon and found themselves doubly welcome since the proved that the road was still open, and also there was a desperate need to evacuate more patients. Some of the cars on their way down for the second time, had to stop and pick up patients from units along the roadside, thus adding to already full loads. Sgt Dickson was advised to leave the town since it was expedited that Termoli would fall unless a bridge some miles to the South could be finished in time to get tanks across into the plain. He went back along a troop-lined ditch and crossed a pontoon bridge shortly before the Bailey bridge, twice destroyed, was finally completed. The fifth ambulance of the section appeared with two of the original four, while Sgt. Dickson continued back to bring up the other two cars and another section. That night the new section of five cars and the two from the original section in Termoli started out with a message to pick up a battery at some place along the way; at that place they would be told whether the road through was still open - such was the uncertainty. The battery was picked up but still there was no news of Termoli. They continued along the road using only blacked out side-lights. Soon even these were ordered out and smoking forbidden. It was so black that any attempt at a convoy was abandoned. As they wound down to the plain a sudden bend brought them within sight of the whole battle; the area was dotted with fires from hay-ricks, tanks, trucks and ammunition; both sides were shelling intensely and at close range. The journey across that plain and into Termoli was rapid. It was now 3 a.m. on October 5th, but there was to be no sleep yet since evacuations had to be made immediately. A counter-attack expected at 4:30 made the late work welcome. By dawn all the cars had reached the 217 M.D.S. where they had a couple of hours to get some sleep and a meal. A third section appeared, released for this particular work by the 1st Canadian Division, and preceded the other ten cars back to Termoli. Things were quieter, but still the situation was touchy. A new A.D.S. had been set up near the bailey bridge thus making the evacuations much shorter; the work though better organized, was not any lighter; tuns were consistent until 1 a.m. that night when finally they got their first good sleep: but it only lasted four hours before they all had to be back at work. During the battle Vols Toms and Terrell were sent out beyond Termoli to bring back an Italian family trapped in a house between the opposing troops, the infantry of both armies crouched behind walls and hedges; but neither of the drivers nor the Medical officer with them was molested when they walked from the cars to the house. However the people were too scared to leave the place, that their risk had been useless. The only mishap occurred when Vols Trainor and Holton were held up on a return trip by a German ammunition truck ahead of them. While they waited soldiers came over from a nearby unit to ask for help with some of their men who had been wounded by mortar fire. While walking towards the unit more shells landed and shrapnel hit Holton'a car damaging the tires. The spares from the ambulances replaced two damaged tires but when all that work had been done a third tire was put out of commission by another shell, so the ambulance had to by left and later recovered. In the mean time three sections (one of which returned shortly to assist in the Termoli evacuations)had gone over to Mota? where the 1st Canadian Division was advancing to Campobasso and beyond. As a result of the rapid distribution of cars to R.A.P.s and A.D. D.S.s Vols Bolte, Meierstein and Railsbach soon had their first evacuation. In order to avoid a long run the M.O. was persuaded to allow the cars to go through a road which had not yet been declared open; It ran parallel to the lines, was under shellfire, and had three treacherous diversions, so bad that it required considerable persuasion to get the cars a chance to prove the way passable. One of the three cars was successful in both directions but Vol. Railsbach failed to get back, and Bolte's car hung on its side over a ravine, saved from loss by a tree. He removed everything he could from the car, and was found next morning sitting on his battery at the end of a neatly lined up row of equipment. Just after the Termoli battle died down the three sections there under Sgt. Dickson moved over to join those who were already with the Canadians, working for the 4th, 5th and 7th Field Ambulances. At the end of October the ambulances were covering all of the forward Canadian R.A.P.s. During the month the cars had travelled 38,764 miles, carrying 2,200 patients, 1329 sitting, and 871 lying. "The American Field Service, Hooray!" THE ANGLO-AMERICAN INVASION OF SICILY BEGAN ON 10 JULY 1943, and on the 24th the capital city of Palermo fell. The next day, on the Italian mainland, King Victor Emmanuel announced the resignation of Benito Mussolini and his replacement by Marshal Badoglio, who outlawed the Fascist Party on the 8th and secretly opened negotiations with the Allies for an armistice. By 17 August the Allied campaign in Sicily was an accomplished victory. The next step was the invasion of the Italian mainland, which had been occupied by German troops in increasing numbers during the summer. The Allied plan was for 13 Corps of Eighth Army to cross the narrow strait from, Sicily to Reggio Calabria. On 3 September, followed on 9 September by simultaneous landings of the Fifth Army at Salerno and of the British 1st Airborne Division at Taranto. On the 8th, General Eisenhower announced the armistice with Italy. The Italian fleet left Taranto to surrender at Malta, which eased the landing of the Airborne Division. But the Salerno landing met with major German resistance. In order to distract the enemy from the Fifth Army beachhead, 13 Corps drove rapidly north, making contact with patrols from the Fifth Army and the Taranto landing on the 16th. By 20 September, the British 5th Division had taken Auletta and the Canadian 1st Division Potenza. The important airfields at Foggia were reached on the 27th, and on 1 October Naples was entered. Although surprised at the number of German troops distressed b inadequate aircover and delayed by heavy demolition and extensive mining-the triple invasion had achieved success. In less than a month, the enemy had been pushed back to positions along the rivers Volturno in the west and Biferno in the east. Here he gave his first indication of making a firm stand. Sardinia had been evacuated by the Germans on 2o September, and On 4 October Corsica was also given up. The Italian campaign, continuing the administrative structure of the Tunisian campaign, was under General Eisenhower as Supreme Allied Commander. General Sir Harold Alexander commanded the land forces Of 15 Army Group-later Allied Armies in Italy (AAI) -comprising the Fifth and Eighth Armies. Under General M. W. Clark, Fifth Army was predominantly American, although at most times during the campaign it had under command a substantial umber of British and Commonwealth troops-notably, during the first phases of the attack, 10 Corps, the veteran troops of the desert advance. The Eighth Army, commanded by General Montgomery, was soon to become larger than it had ever been in the desert, aid during the course of the Italian campaign it was to be further augmented with troops from many nations. 0n 1 October, l3 Corps of Eighth Army began the attack on the enemy�s Biferno postions-78th Division on the coast directed toward Termoli and the Canadian 1st Division, inland, aimed at Vinchiaturo along the Foggia-lsernia lateral road. The major assault began on the night of 2/3 October, when a Special Services (Commando) Brigade made a successful seaborne landing behind the enemy lines in the town of Termoli, while 78th Division attempted to bridge the Biferno south of the town. The British landing took the enemy by surprise. Termoli was quickly taken and connection was soon made between the Cornmandos and 78th Division across the river. At dawn on the 4th, the Germans began their counterattack with a bombing and strafing party rushed a division over from the west, and exerted increasing pressure in the effort to drive the British from their newly gained positions. The daily autumnal rains, which had begun with a huge thunderstorm on 28 September, were turning all but the best roads into rivers of mud. In the meantime, the first contingent of the American Field Service had arrived Taranto to take its place with Eighth Amy on 1 October. D Platoon Of 567 Company disembarked intact the next morning (the first car was driven ashore by W. E. Oates at 8 a.m. and was ordered to drive quickly to 13 Corps HQ north of Foggia for immediate posting to the Canadian Division. By the 3rd, - most of the Platoon was assigned: 15 cars to the Canadian Division and 10 to 217 Field Ambulance of the ambulance-shy 78th Division. The sections for the 217 FA went north to its MDS, about 25 miles south of Termoli, and went right to work. That evening, however, H. S. Terrell's section (including P. H. Culley, W. B. Doyle, G. E. I-Holton, M. Smith, and H. W. Trainor) was sent on up to the ADS in Termoli, led by Platoon Sergeant R. Dickson on his motorbike. "The British were entrenched on the coast," one of the group reported, "and jerry was on the other side-close enough so that we could see him. And the road was in the middle, and so were we. Every time one of our cars started down the road it seemed as though both sides stopped firing, although there still was a lot of stuff flying over us. We just pushed down the accelerator and kept our eyes on the road." Additional British brigades were landed at Termoli in the next couple of days to meet the German counterattack, and the fighting for the city, seesawed fiercely. On the 4th, J. P. Horton recorded, "2 cars started out at 6:30 to make the 28-mile run back; there were at least 12 diversions along their route, made dangerous by the heavy rainfall. The British Austins of the Field Ambulance were unable to go through, so the whole work fell to our Dodges, which have 4-Wheel drive. By 9 o'clock the MDS and ADS were clear of patients, but the schoolhouse adjoining was becoming jammed with casualties caused by concentrated shelling centring around the square where the medical units were stationed. The shelling had started at 8 o'clock and continued until noon. All the cars had gone out, and while they were gone the Germans occupied the station on the south side of Termoli. The ambulances began to return shortly before noon and found themselves doubly welcome since they proved the road was still open and there was a desperate need to evacuate more patients. Some of the cars, on the way down for the second time, had to stop and pick up patients from units along the roadside, thus adding to already full loads. "It was expected that Termoli would (be taken by the enemy) unless a bridge some miles to the south could be finished in time to get tanks across into the plain" At this time it was suggested that the ambulances, filled to capacity, evacuate the town and not return. But, although the patients were carried back to the comparative safety of the MDS, Terrell's ambulances returned to their post with the ADS in Termoli. An additional section of ambulances was needed in Termoli on the night of the 4th, and W. A. Rich's (including L. G. Bigelow, J. C. Harkness, F. M. Marler and L. Toms) was sent up. With two cars from the original section at Termoli according to Horton's account, they "started out with a message to pick up a battery at some place along the way. At that place they would be told whether the road was still open-such was the uncertainty. The battery was picked up, but there was no news of Termoli. They continued along the road, using only blacked out sidelights. Soon even these were ordered out and smoking was forbidden. It was so black that any attempt at a convoy was abandoned. As they wound down to the plain, a sudden bend brought them within sight of the whole battle: the area was a mass of flames and vivid flashes; burning tanks, hay-ricks, trucks, and ammunition dotted the entire scene; both sides were shelling at close range. No wonder that the journey across into Termoli was rapid. It was now 3 A.M. on 5 October, but there was to be no sleep yet, since evacuations had to be made immediately. A counterattack expected at 4:30 made the late work welcome. "By dawn" all the cars had reached the 217 MDS, where they had a couple of hours to get some sleep and a meal. A third section appeared, released for this particular work by the 1st Canadian Division, and preceded the other 10 cars back to Termoli. Things were quieter, but still the situation was touchy. A new ADS had been set up near the Bailey bridge, thus making evacuations much shorter. The work, though better organised, was not any lighter. Runs were constant until 1 A.M. that night, when finally they got their first good sleep. But it lasted only four hours before they all had to be back at work.". Lt. F. J. Murray lad led the third section of his Platoon into Termoli (including L. M. Allen, 1. G. Fogg, J. E. Gerhardt, W. H. Lord, and W. E. Oates), bringing them a cookhouse and a water truck. A mess for the three sections was set up in a restaurant across the street from their billets, so that during the following few days, while the group completed the evacuation of the ADS, their living arrangements-in spite of the constant shelling and occasional sniping in the town-were considered quite pleasant. The battle for Termoli was short and nasty. The German resistance was fanatically stiff until, conceding defeat, it suddenly melted away in the night, leaving only a slight rear guard to perform harassing operations. The D Platoon cars worked steadily through an area under shellfire and sometimes worse. G. E. Holton, distinguished himself by his level-headed conduct under some very accurate shellfire-arranging for casualties from an exploding ammunition truck, and a subsequent shelling of the illuminated area, to be taken on to medical aid while at the same time trying to repair his immobilised ambulance. 0n another occasion, Terrell and Toms went up between the lines of opposing infantry in an attempt to evacuate an Italian family to safety-only to discover when they had reached the farmhouse that the Italians preferred to stay where they were. In the meantime, the Canadian 1st Division advanced toward Campobasso, the 3 D Platoon sections joining it at Mota. "As a result of the rapid distributions of the cars to the RAPs and ADSs," Horton's report continues, "Bolte, Meierstein, and Railsback soon had their first evacuation. In order to avoid a long run, the MO was persuaded to allow the cars to go through a road which had not yet been declared open. It ran parallel to the lines, was under shellfire, and had 3 treacherous diversions -so bad that it required considerable persuasion to get the cars a chance to prove the way passable. One of the 3 cars was successful in both directions. But Railsback failed to get back, and Bolte's car hung over the edge of a ravine-saved from loss by a tree. He removed everything he could from the car and was found the next morning sitting on his battery at the end of a neatly lined-up row of equipment." The area Termoli-Guglionesi was firmly in the hands Of 78th Division by 7 October. When their work for the Termoli ADS was finished, the 3 AFS sections there under Sgt. Dickson joined those already with the Canadians. They were assigned to the 4th, 5th, and 9th Field Ambulances. The Canadian Division had the Campobasso-Vinchiaturo area by the 13th, and, after a short rest, it continued the slow and difficult advance toward Isernia. At the end of October, D Platoon cars were covering all of the forward Canadian RAPS. Of the AFS members involved in the action at Termoli, Bigelow, Dickson, Rich, and Terrell were at the very time suffering from the yellow jaundice. This scourge had hit the Company before it left Tripoli, and many had made the voyage while enduring the extreme lassitude and violent peevishness, combined with disinterest in all available foods, brought on by the disease. Of the personnel to land with the first 48 ambulances on 2 October, 6 men were immediately immobilised by the wretched disease and many others were close to collapse. By 9 October the whole Of 567 Company had finally landed in Italy, and A, B, and C Platoons leaguered with the Company HQ at Mare Piccolo, just outside Taranto. On the 12th they drove north, Company HQ establishing itself in an apartment on the outskirts of Foggia. Here a separate room was set aside as a private AFS jaundice ward. Malaria and dysentery were also troublesome, but when a count was taken on , November 30 of the 37 sick had jaundice (invective hepatitis), a far more serious near-epidemic than had hit the Company in the desert in the previous November and December. By shifting men temporarily from one platoon to another, all cars were kept covered until the scourge had passed. But although the Company was unusually well staffed at this time, the severe sickness rate made the manpower situation extremely tense. This shortage of personnel was particularly awkward at this time. Brigadier Phillips (DDMS Eighth Army) had given 567 Company a most flattering welcome to Italy. The Company had been scheduled to work for the rearmost installation-Fort Base. But Brigadier Phillips had persuaded Fort Base to accept an Army MAC in exchange. By 14 October, all 4 platoons of 567 Company were out on Corps assignments -A and D Platoons with 13 Corps, B and C with 5 Corps. From the Sicilian campaign, 13 Corps had come to Italy with the 1st Canadian and 5th Divisions, to which was later added 78th Division. When the 8th Indian Division arrived, it was grouped with 1st Airborne and 5th Divisions as 5 Corps. This was used to back the 13 Corps advance up the cast coast. During October, Eighth Army continued to build up its strength in Italy, and the AFS was frequently assigned to units it had already known in the desert. More than half of B Platoon had landed with D Platoon at the beginning of the month. 0n 3 October it sent 12 cars to 141 LFA (5th Division) at Potenza, another 6 going to 131 FA (1st Airborne Division), then at Gioia. Several cars from 141 LFA were loaned to 158 LFA, some doing hard wok with the ADS at S. Croce del Sannio and others having long but routine evacuations to Taranto. When the whole Platoon had arrived it was assigned to 8th Indian Division, and 10 cars went to 9 Indian CCS at Andria on the 12th. Two days later B was relieved of its 5th Division posts by A Platoon, and the cars went to a camp l0 miles south of Foggia to wait for the rest of the Indian Division to arrive. However, the Division had no need for the extra ambulances, and B Platoon was ordered to form a 5 Corps reserve pool at Serracapriola on 21 October. When A Platoon took over the 5th Division posts on 14 October the bulk of its cars went to 141 MDS at Segezia and 6 to 158 ADS at S. Croce-both groups evacuating to Foggia, to either 164 MDS (from which 3 attached AFS cars evacuated to Barletta) or 7 CCS. On 21 and 22 October, 17 ambulances were attached to 15 CCS at Campobasso, to work back to 132 FA at Volturara, the rest moving northwest with the Divisional units to which they were already attached. The AFS publication Janus listed your Web site with reference to the battle of Termoli in Italy in October ,1943. I served as a driver one one of the first six AFS ambulances assigned there and remember it vividly because it was first battle experience. Our ambulances arrived at the big school building on the town square int the dark, I guess around 9 p.m. The medical officer had his RAP set up in the basement and he assured us the Germans would give us a wakeup call. 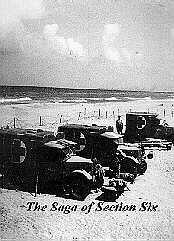 I slept on the ground under my ambulance and sure enough at first light a couple of German fighter planes appeared and did some bombing.. Our ack-ack unit on the beach near the castle had experience on Malta and one of their Bofors 40s scored a hit on a German plane. We evacuated our first group of casualties immediately. We were told that we were facing the 16th Panzer Division which had been transferred from the Russian front. We had about a 25 mile run from Termoli back to the Advanced Dressing Station -- near San Severo, as I recall. On my next run I found a Tiger tank parked on the railroad tracks, not far from the bridge which our road cossed. The tank did not fire at me. It was about 50 yards from the bridge. We were serving with the 78th British Division -- the "Battleaxe Division" because its uniform patch was a yellow battleaxe on a black background. First class outfit with an excellent reputation. I remember going withoug sleep for three days during the battle. Finally at dusk on the third day I arrived back at Termoli to find four or five ambulances pulled up up on thhe upward sloping road that was at the edge of town. I pulled over too because mortar shells were coming down. George Holton told me all the ambulances had been knocked out of action and I would have to take the only causalty still living. He was brought on a stretcher and put in my ambulanceand a British medic got in with him. The medic's name was private Johnny Reilly of the London Irish Regiment. He was glad to be driven by a Doyle. I turned the car around and as we headed down the slope I realized my brakes were gone -- the mortar fire had severed the thin pipes carrying the brake fluid. But the hand brake still worked. Our casual;ty had a huge wound in his back and Johnny held his hand as he died, murmuring "Mother." When we got to the ADS I found my face was wet with tears. It was my first battle experience. I served with AFS in 8th Army in Italy until December 1944. My last battle work was at Cesena in the Po Valley. If you would like to read more about the experience of Section Six in Italy, read this book avaliable from Eleanora Golobic, Archives, AFS Intercultural Programs for $24.00 (this price includes shipping and handling in U.S. and Canada, more for overseas shipping).